Home > Articles > Where is Mobily Visual Voicemail? One of the features of the iPhone 3G is “visual voicemail” which lists all of your voice messages and play them in any order that you want instead of sequentially. 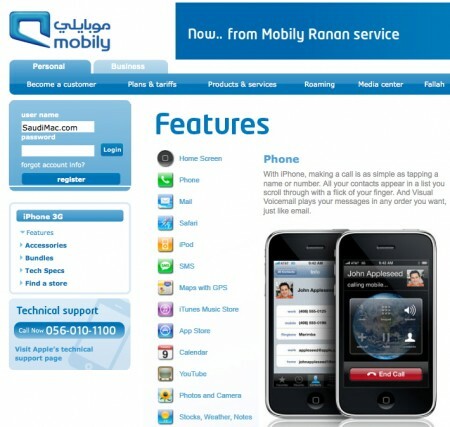 On Mobily’s website visual voicemail is listed as an iPhone 3G feature. However on this official knowledge base article Mobily doesn’t have visual voicemail supported. Is this false advertisement or is Mobily actually working on visual voicemail? Update: Thanks to the comments, this is a picture from Mobily’s website with a “screenshot” of visual voicemail which is not present. I’d say its because they don’t know anything about what they have put in their website. Having communication with staff inside mobily they told me this feature is at the moment not even under development. Oh and FYI it’s the saudi staff’s fault for false information. Saudis works are of the worst kind according to mobily and it was extremely difficult for mobily to find employees of Saudi National. This information was given by a Etisalat Staff who shifted to mobily (Etihad Etisalat) 3 years back. Oh and this answers clearly why wrong information ends up in the website. The vast majority of carriers don’t have Visual VoiceMail. Even a lot of them in Europe. So no expectation that Mobily would put in the effort unless it was worth the investment. I personally have not seen voice mail being used that often in Saudi, so there may not be adequate justification. Do they have a business case to implement it? 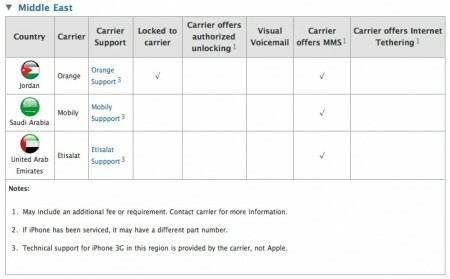 How many EXTRA people would buy iPhones because they had visual voice mail? Probably not many. I didn personally mean that All saudis are like that. But the fact that its pretty tough to get the good ones and same time the Saudization. If you follow ArabNews you’ll read lot of articles regarding this matter. This is an actual image of visual voice mail with Arabic names, it’s no longer a small mistake to translate text … but add an image? $50 says they’ll here about this and will take that photo down soon in fear of getting sued. consumer protection laws in Saudi Arabia aren’t really enforced, look at STC. true! And once again khaled spits out the 3 letters S-T-C. The EPIC FAIL. Oh yeah? Well I think it is a dirty marketing scheme. This is a link to mobily website, where they have a picture of an iPhone displaying (what is assumed to be) visual voice mail. WIth Arabic sounding caller names. That pic was there before they started selling iPhone. Nothing to do with their iPhone marketing. Used the image to market Voicemail. Like other services where they show the never seen phone screen. It might have been there earlier but it sure don’t make it right. Anybody is able to use the COLLECT CALL SERVICE “Khaliha Alai’ from mobily through their iphone. Whenever I deal *9 followed by the number it says “sorry you cannot use the collect call service”. All phones to mobily service centers were just waste of time. Even I am not being able to receive phone if someone uses *9 followed by my number. Anyways its expected. Value added services are always screwed. Till date credit transfer doesnt work well. Sometimes the trasfer occurs late night around 3 am when i made the transfer request around 6pm. Lame. Even International MMS never reaches Oman. But works fine when send to UAE. I dont know why, but it just doesnt work with my iphone package. I have another mobily minutes bundle and it works fine with it. Nobody facing this problem? When exactly in August will the iPhone 3GS be available here in Saudi? And, how about for Etisalat in the UAE? I am a first time reader of this website! I am totally unhappy with your comments regarding the Saudi working force. I do agree that some are really not knowledgeable or whatsoever but that does not make us a nation of stupid! As a Saudi mac professional I take an insult from what you’ve said and I wonder how come a “Saudimac” website will allow that! If you want to talk about the matter … then demand a fix and blame the company for the lack of training or maybe the wrong hiring process but just to bash Saudis like that is totally unacceptable. You’ve got guts to come to “Saudimac” and talk like that, really! I guess its regarding the matter that I had posted a month back. I deeply apologize if it has offended you this way. I didn’t mean to and infact I did not post it to make fun or in other words Bash saudis. My main motive was to discuss about ONLY the downside of Saudi Arabia nothing to be on the racist side or of any sort. Me being an Indian I could tell you that India was far worse than saudi. Everycountry will have their own downside. And I have no relation with this website except that i’m just an ordinary reader like you. Once again I’m deeply sorry. GO TO THE DIAL PAD AND PUT THE FOLLOWING: *5005*86*955# AND PRESS THE DIAL ICON AND VUALA IS READY. PROCEED TO PRESS THE VOICEMAIL ICON AND FOLLOW THE INSTRUCTIONS OF STC. Quick poll for mobily iPhone users in Saudi.. Would you use visualvoicemail if offered? é”˜ç¸„ was really pleased to find this web-site. I wanted to thanks for your time for this wonderful read!! I certainly enjoying each and every little bit of it and I’ve you bookmarked to look at new stuff you blog post.